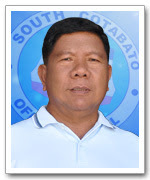 Some 4,000 barangay tanods in South Cotabato may soon avail of the insurance coverage from the provincial government as Hon. Agustin Dema-ala, chairman of committee on public order and safety, passed a resolution for the granting of insurance coverage to all members of the barangay tanods in the 199 barangays in the province and providing of funds thereof. Dema-ala said these barangay tanods are oftentimes exposed to risks of bodily harm and even death due to the nature of their work. And with the meager income they get from volunteer work, they often seek medical care and financial assistance to the provincial government in times when emergencies happen. “ The provincial government should take the lead in providing them with group life insurance coverage to help them and their families in times of crisis,” Dema-ala added. Dema-ala specifies that the province has to allocate some P400,000.00 on a yearly basis for the group life insurances of these barnagay tanods. “These are just small amounts if we think of the services that they render for the safety of our constituents.” he said. The Local Government Code of 1991 also provides that all duly appointed members of barangay tanods and their equivalent shall be granted insurances and other benefits chargeable to the barangay, city or municipal government to which the barangay belongs.